M N Krish holds a BTech degree from IIT and Masters’ degrees from MIT. He has lived in India, US and Asia and has spent a good part of his life teasing stories out of numbers to do anything from scheduling planes to selling insurance (not simultaneously). 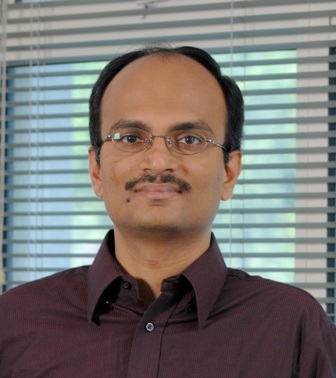 He is currently back in his hometown Chennai and works at an analytics consulting firm. His debut novel THE STERADIAN TRAIL: Book #0 of the Infinity Cycle was published to international acclaim. Read his interview here. Below you can read an excerpt from his novel, The Steradian Trail. Courtesy: M N Krish. The second bullet keeled Jeffrey over and he dropped the duffel bag and car key and tumbled down the flight of steps like a sack of coals. There was a rustle among the leafless shrubs lining the walkway to the parking lot, soon followed by the squelching of shoes in slush. His breath fogging in quick spurts in a fit of panic, he gripped the wrought-iron banister and tried to rise to his feet, but his shoes kept slipping in the snow. He continued to try nevertheless, like a hamster on a wheel, but stopped when he found himself face-to-face with a hulk in a hoodie. The hulk ran his eyes over Jeffrey for a moment, then turned away and went nosing about the gym’s entrance. He picked up the car key lying on the steps and flung it up and away into the darkness with all his might. That done, he sprang down the steps in two hops, grabbed Jeffrey by his lapels, and pulled him up a little. Then thrust his pockmarked face menacingly close to Jeffrey and shook him. Jeffrey made no reply. He went limp in the thug’s hands and then started twitching a little. The thug patted down Jeffrey’s pockets and fished out his wallet and cell phone. Shoving him away and letting him slump to the ground, he tucked the loot into his pocket and tore away towards a grey Corolla that lay in wait across the street, rumbling, ready to go. By the time a helpless Jeffrey heard the car zipping away, he was bleeding profusely from the two puncture wounds. His head throbbed feverishly and his body winced with unbearable pain. Moments back, he was standing in front of the gym door after an invigorating workout, feeling the chill air whistling into his windpipe and diffusing in his lungs, gazing at the silent snowfall with an equally quiet admiration, marvelling at the fractal patterns that ruled all the way from the tiny snowflakes dancing in front of him to the humongous old temples he’d seen in India. And now, he was gasping for breath, a fire raging in his gut, sweat beading his brow. It didn’t take Jeffrey long to come to the realization that he only had minutes to live. He had heard that gastric acids were safe only as long as they were confined to their sacs where they could be continuously neutralized; once they oozed out, they’d burn away the tissues to death in a matter of minutes. Whatever he had to do, he had to do within that window, with whatever strength was still left in him. He could think of only one thing . . . pass on information to nail his killer, the real killer. At least that way, he would have his revenge, even if posthumously. Now he could see why his cell phone had been taken along with the wallet. There was a phone inside the gym, but with his wallet gone and his ID along with it, there was no way he could open the door and get in. But he quickly remembered that there was an emergency callbox in the gym’s parking lot. It was perhaps forty yards away and there was no guarantee that he would even make it that far, let alone speak articulately. But with a definite death staring down in his face and the slush making it impossible to leave a message in blood, that seemed like the only course left to pursue. Jeffrey was no mere fitness freak but a muscle maniac who tended to every fibre in his body with the utmost precision and care – nothing else would explain his lonely visit to the gym so early on a winter’s day. All that effort came to the fore now in his final minutes. Mustering every ounce of energy left in his fast withering body, he dragged himself towards the parking lot, tumbling and scrambling every inch of the way, the dripping blood blending with snow and congealing in crimson patches in his wake. He collapsed at the foot of the phone post, after barely managing to slur a few incoherent words into the callbox. A strange peace swept over him as he passed out: even if the name didn’t get through properly the magic number he’d uttered would definitely drive home the message. For someone used to going gadding about town in a limousine – when not driving his own Bentley, that is – the Expanzo was not the best mode of transport Joshua had seen. However, that was all he had at his disposal right now, replete with its soda-can shell and pet-crate leg-room. But he wasn’t going to complain. On the contrary, he was pleased that Indian motor travel had finally graduated past those curvy creamy caravans from prehistory, running on adulterated petrol, belching out billows of jet-black smoke that threatened to asphyxiate one to death: Ambassadors. The new millennium had just dawned and India was slowly wriggling out of the clutches of the government and hobbling into the arms of the market. Joshua, an optimist who looked at the cup as half full rather than half empty, preferred to view the Expanzo, in spite of its toxic tailpipe and budget airline leg-room, as a positive indication of that economic evolution. Joshua was no stranger to India but he hadn’t come across a chauffeur like Durai Raj. Durai spoke English with a rare degree of fluency for an Indian car driver, give or take a staccato phrase or splintered sentence. It had gone a long way towards establishing a good rapport between them. Durai’s facility with the language and his polished and neutral accent had intrigued Joshua from the start. But only now, with barely hours to go before he took off on a flight to Boston via London, could Joshua break out of his inhibition and ask him something that had been on his mind ever since he met him. ‘Do you mind if I ask you something, Durai?’ Joshua said. ‘No sir!’ Durai said, the shock showing on his face. ‘Call centres are like Chinese factories, sir,’ Durai said. ‘My cousin worked at a call centre for one year and is suffering already. He has to take calls one after another without a gap, sir. Says he can never leave the chair without the team leader’s permission. Has to get permission even to go . . . you-know-where, sir.’ He sheepishly lifted up his little finger and made that universal gesture. ‘You mean . . . use the toilet?’ Joshua asked him, just to make sure. ‘That’s a shame,’ Joshua said. The logjam started clearing and Joshua let Durai manoeuvre the vehicle out of the Gemini interchange onto Mount Road and set it on a more or less steady course to the airport. Joshua spent the rest of the drive thinking about the immediate tasks that lay in wait for him in Boston. Like most people at his level he had left himself completely at the mercy of his assistant Nancy these six weeks, reading and responding only to those few mails she had flagged for his immediate attention. Though Nancy had been holding the fort well, managing his office in his absence, he was going to have his hands full upon return. As soon as the car pulled up by the kerb at the airport, Joshua fished out whatever Indian rupees remained in his wallet. Durai’s face lit up as he caught sight of the crispy bills in the rear-view mirror. This was the moment he had been waiting for. The cab fare had already been paid upfront at the hotel. Whatever Joshua gave him off the record would be his exclusive tip, a well-deserved award for a service with a smile. With each passenger bringing along a small tribe of relatives to see them off, the departure area was teeming with hundreds of people who spilled out onto the road and choked the traffic, slowing it down to a crawl. Currency touts were doing their rounds, weaving in and out through the crowd fanning a bundle of five-hundred rupee bills – some minted in Karachi, some in Sivakasi. Durai, inspired by the impending tip, sprang out of the car with a fresh burst of energy, keeping one furtive eye on the hawala touts in case Joshua dished out any US dollars. The shiny exterior of the Expanzodrew the attention of two nosy onlookers standing nearby. They edged closer to Durai and tried to take a peek inside the vehicle, but Durai shooed them away and held the door open reverentially for Joshua. Joshua stepped off the car and slipped on his jacket, feeling the breast pocket with some apprehension to make sure his passport and ticket were still there. He slung his laptop onto his shoulder. It housed the only copy of all the notes he’d made in India and he was not going to take any chances with it. ‘Please wait here, sir. I’ll go get a trolley,’ Durai said and dissolved into the crowd. He materialized in no time with a trolley in tow and started transferring the luggage from the boot. ‘Thank you very much, sir. Have a nice flight,’ Durai locked the boot and said in eager anticipation of his tip. Before Joshua could respond, a wail of sirens Dopplering in rent the air, plunging the crowd into a hush for a moment. Within seconds, a large fleet of police cars and jeeps, as if in a ministerial motorcade, sailed into view. Horns blaring, lights flashing, they homed in on the departure area and screeched to a halt by the kerb, screaming onlookers scattering like coins on a carrom board to get out of the way. Joshua froze in his spot, stunned by the abruptness of it all. Police officers quickly popped out of the vehicles and hurried towards the main entrance, cleaving through the crowd gathered in front, craning their necks, scanning people’s faces at random. Joshua was so taken aback he didn’t even point out that the officer was mangling his name. ‘Yeah?’ he said. ‘Can I see your passport?’ The officer stretched out a brawny hand. Joshua fished out his passport from his breast pocket and handed it over. The officer flipped through the pages and tallied the photograph with Joshua’s face. Satisfied, he closed the booklet and tucked it into his shirt pocket. Then he gave a thumbs-up sign to another cop standing near a car. Joshua could hear the officers whistling or yelling to one another, relaying thumbs-up signs and calling off their search. ‘You need to come with us,’ the officer said to Joshua. Before Joshua could open his mouth, four other policemen trooped in and circled him. It didn’t feel like he had much choice in the matter; the officer’s tone had a certain finality to it and the ring of four cops removed whatever doubt remained. Joshua tucked the cash in his hand back into the wallet and followed the officer. As he wheeled around, he could see another policeman pointing at his luggage and saying something with a stern face to Durai Raj who was leaning forward with his arms folded and nodding deferentially – a typical Indian shake of the head, more of a roll than a pitch or yaw, whose meaning Joshua always had a hard time decoding.